Cultivation and sake brewing are both difficult, but Omachi (rice) is an important basis to good sake. By insisting on this rare rice, the master brewer is able to fully utilize the master skills of Bitchu-style sake production. The result is a broad, mild sake with umami flavours that is unique to Omachi rice sake. Especially nice as a sake served with meals, it pairs excellently with a variety of dishes. Light, white fleshed fish dishes are a given, but this sake also matches oily blue-backed fish and seasoned meat dishes; it is a fine product that can be enjoyed at a variety of temperatures, chilled or warmed. This sake is made from naturally cultivated rice which Akinori Kimura (known as "Miraculous Apple") proposed to grow using no fertilizer or agricultural chemicals; we hope you enjoy of the natural goodness of this sake. The motto for the making of this product is "fastidiousness for delicious sake production to relay to the future", and we work insatiably to continue to improve in making delicious sake. This is a premium, luxurious sake made from polishing the pride of Okayama, Omachi rice, to 50% of its weight. In the cold season, while the fermentation proceeds slowly at a low temperature, the skilled brew master develops his artisanal skills and intuition.  The well-rounded, fine taste specific to Omachi rice is a characteristic of this sake. This brewery stands in the Tamashima area of Kurashiki City in Okayama Prefecture, one of many port towns for the large, wooden stone-hauling ships that departed from the Bitchu area. In a corner of the traditional town, this brewery has been in business since 1878. This Bitchu-style sake and the brew master receive high marks at competitive fairs. Boasting excellent water quality from the Takahashi River valley and together with the superior rice strains Omachi and Yamada Nishiki, quality-oriented is our motto in producing sake the traditional way. It is rare in Okayama Prefecture that our current brew master is pioneer is also a musician. In 2015 at a New York restaurant, he performed on the violin at a sake dinner event. Sake brewed with a delicate sensitivity as well as a touching performance both received applause. Kikuchi assumed the role of head of sake production and brew master in 1996 with the idea that he wanted to produce with his own hands "a delicious and crisp sake that one won't forget after drinking it just once, an ideal sake." Combining knowledge of fermentation engineering acquired at the Faculty of Engineering at Hiroshima University and Bitchu-style traditional skills for sake production, management of sake production is carried out precisely. As a musician, he was instrumental to the rise of local arts and culture such as the establishment of the Kurashiki Chamber Orchestra (currently the Kurashiki Orchestra) in 1974 and more, and in 2006 was honorably awarded the Kurashiki City Cultural Prize. The concept and carrying out of concerts at breweries are also his brainchild, and the playing of Mozart's music for over 10 years are just some of his unique experiments which attract attention.